Unique details like the pleated skirt and paperbag waist make this dress stand out. The Pleats To Meet You Paperbag Waist Dress is fully lined and has an invisible layer of tulle underneath the skirt for volume. 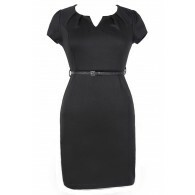 It features a sweetheart neckline, lightly padded bust, and adjustable spaghetti straps. Fabric pieced together at the bust adds detailing to this dress. The attached skirt has a unique paperbag waist, subtle pleating, and an A-line cut. A hidden back zipper completes this dress. The Pleats To Meet You Paperbag Waist Dress would look great paired with pumps, wedges, or heels. This dress is a blank canvas you can accessorize so many different ways. Fit note: This dress runs short. Details: Fully lined. Lightly padded bust. Adjustable spaghetti straps. Tulle lining. Hidden back zipper. 100% polyester. Hand wash cold. Do not bleach. Do not iron. Small measurements: Length from top of bust to hemline: 26". Bust: 32". 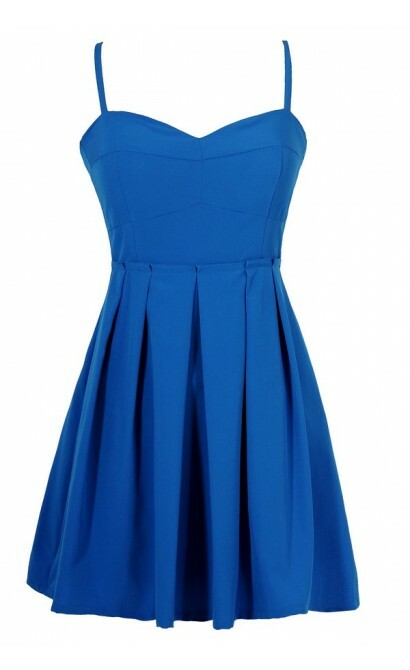 You have added Pleats To Meet You Paperbag Waist Dress in Bright Blue into Wishlist. You have added Pleats To Meet You Paperbag Waist Dress in Bright Blue for Stock Notification. You have set Pleats To Meet You Paperbag Waist Dress in Bright Blue as a loved product. 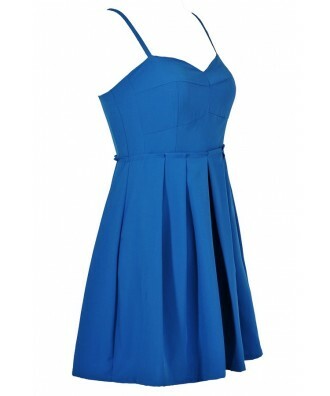 You have removed Pleats To Meet You Paperbag Waist Dress in Bright Blue as a loved product.